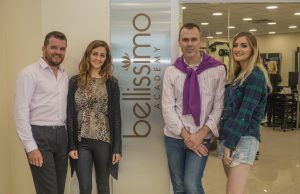 Trendvision Awards 2018 named five stylists from Bellissimo, Limerick. Creative Vision Award Winner Aileen Hannan from Bellissimo pictured with Charlie Taylor, her model and host James Kavanagh at Icons Live Featuring TrendVision Awards 2018 Ireland Heat. 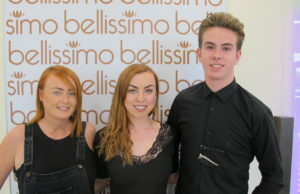 There was great excitement last Monday as five Bellissimo stylists woke at the crack of dawn to make their way to the Capital to take to the international stage for the Trendvision Awards 2018 in Dublin. 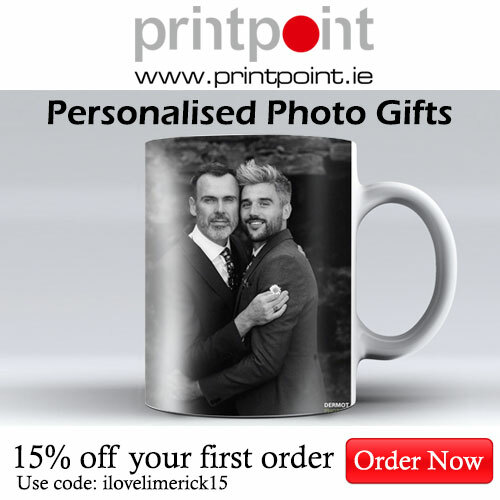 After months of hard work for stylists Lauren, Breda, Ali, John and Aileen, it was finally time to show the hair industry what Limerick brings to the table. The five stylists were named among a select few as finalists after thousands around the country entered the initial photographic round. A busload of staff and family left from the salon later that afternoon to lend their support, and they weren’t disappointed. Junior Stylist Aileen secured a win in her category Creative Vision. Her look was inspired by a recent trip to South Africa, where she was excited by the freedom of the street style in Johannesburg. With a tip to her electric personality, she presented to the judges a 3D mood board which was designed in the layout of an atom. Aileen began her career in Bellissimo just 2 years ago. In a first for Bellissimo, Aileen runs a column as a makeup artist while also training to be a stylist. Her unique style and considerable talent have led to a very promising future for the young trainee stylist. Aileen will fly to London in October after the Trendvision Awards 2018 to represent Bellissimo on the world stage.